A casual conversation with one of my friends online led to him asking the developers of a game he had told me about for a review code for me, I honestly didn't think it would work but it did. I'm so grateful whenever I get sent anything and after seeing trailers for this game once Jamie mentioned it I fell in love with the artwork, you will see what I mean once you see the screenshot's I have added. 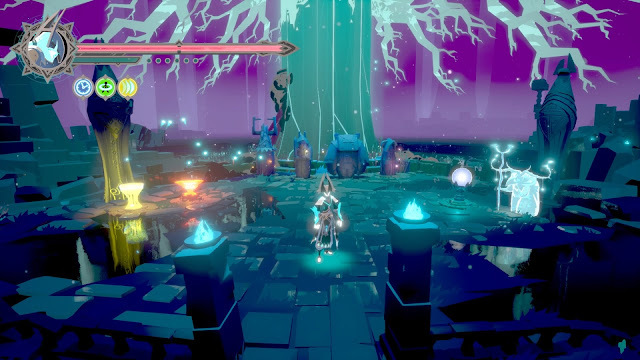 I'm sure most of you know I'm a sucker for anything pretty when it comes to a game, Omensight is no exception when it comes to this, my first impressions of it was how magical the surroundings and protagonist look, kind of reminds me of a mixture of Tron infused with Journey and they are two loves of mine as it is. The game is set in a world full of animals, a world which I would happily live with as animals have pure little souls, but unfortunately a war is taking place and it's only getting worse, fortunately for this world you the Harbinger was summoned by a witch to solve the mystery of the priestesses death but in order to solve it you will need to travel back in time, games to do with time travel are my weakness I'm sure a lot of you know this already! I actually didn't know that a Harbinger was real until I looked it up, it's kind of an omen that can see the future which goes hand in hand in showing characters in the game what will happen in the future when Harbinger travels back in time. Due to the priestess dying this means that the end of the world is going to happen and Harbinger must stop it in time so The Void doesn't destroy the world. Harbinger can't go back in time too much and can only return to what happened 24 hours ago when the priestess was murder and The Void started to take over. 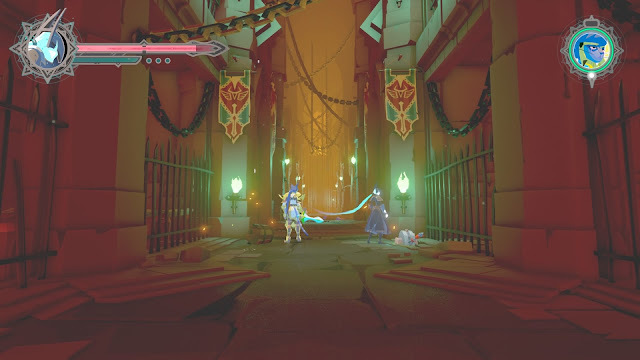 Each character all have a unique look and feel to them, I would have to say my favourite out of them all was Harbinger and Vera the Priestess, Vera reminds me a lot of The Book of Life (movie). Omensight stands out vividly with the bright colours although the story behind it is very sad, I think that's what makes you feel like there is hope, bright colours tend to improve my mood and made me determined to save the world within the game. 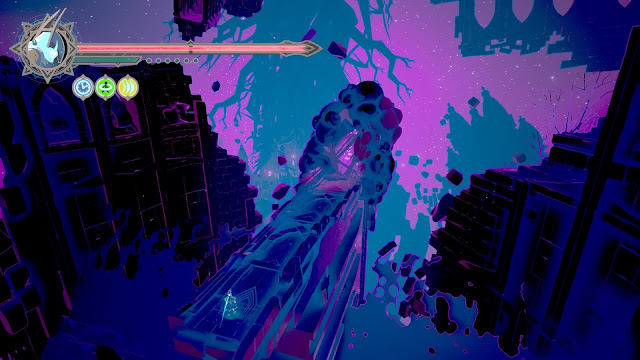 Whilst playing I found the jumping to be very smooth and easy, I'm a terrible jumper in games usually so I was relieved I could get through Omensight without falling too much, In order to level up you must collect orbs of light which you use by meditating infront of a statue and slowly the amount you put in will increase and light up the statue, I like this because it makes you put in more effort to go back and replay parts that you have already done, the higher level you are the easier enmies are to kill, it also helps you unlock fighting moves to kill deafeat enemies with. Another thing you can collect is called Amber, you will be able to use this to level up your health, sword etc which the game calls blessings, I suggest you destroy as many barrels and open as many chests as you can so you can unlock them all for the final boss fight. There are memories which you can unlock that help in solving the mystery of Vera's death there are 24 to find, unfortunaly I have only found 17 but need to replay the game to find them all as well as these you need to unlock clues in order to find out which out of the 4 characters you fight with to go to next whilst you're the tree of life, the story is pretty easy to follow but will get repetitive, but each time you do go back you can either fight the person that you have reached or show them a vision by using omensight and each time it will lead you on to a different part of the story helping you find more clues and more doors to unlock, some have memories hidden behind them, some have a dentornator or just chests behind them but either way the doors help you to level up, deafeat and solve the case. In order to get the ability to open each coloured door you have to get the power from different characters but eventually, you will end up with them all before the game is near to being finished. 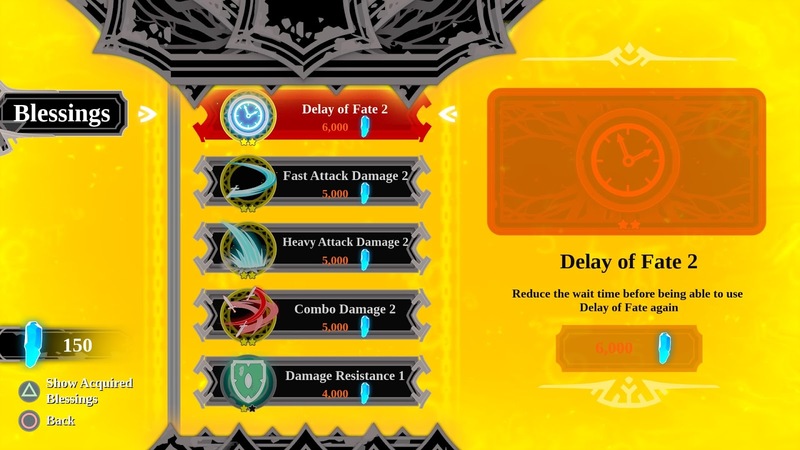 I chose Story Focus as I wanted to just dive right in and play the story, yes it's probably easier than the other modes but still enjoyable, I managed to get 70% of the trophies by using this mode, I need to go back on to the game to try to get the few that are left over which look easy enough to do. 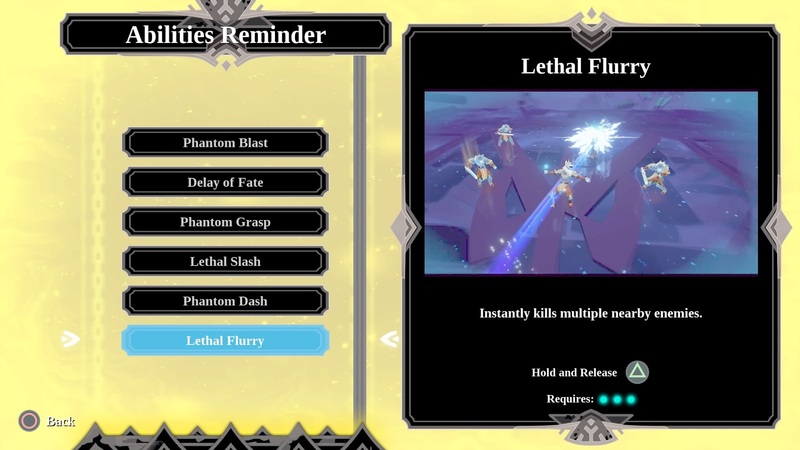 There are certain moves you can get trophies which I'm not that great at right now, although I do like the Lethal Flurry move which allows you to instantly kill multiple nearby enemies by holding and realising the triangle button. Spearhead Games have done a great job at developing a game that allows time travel without the story getting confusing and hard to follow, I would like to try out Tiny Brains which they developed back in 2012 from the look of it their games all involve animals which I'm not complaining about! Since finishing the game I have played it back through a few times to level up a bit more and hope to unlock the memories that I have missed, being able to do this makes the game worth the price (£18.99), in my opinion, it took me over 8 hours to complete as I took my time to play it and died a fair few times when the enemies were too strong for me to defeat. 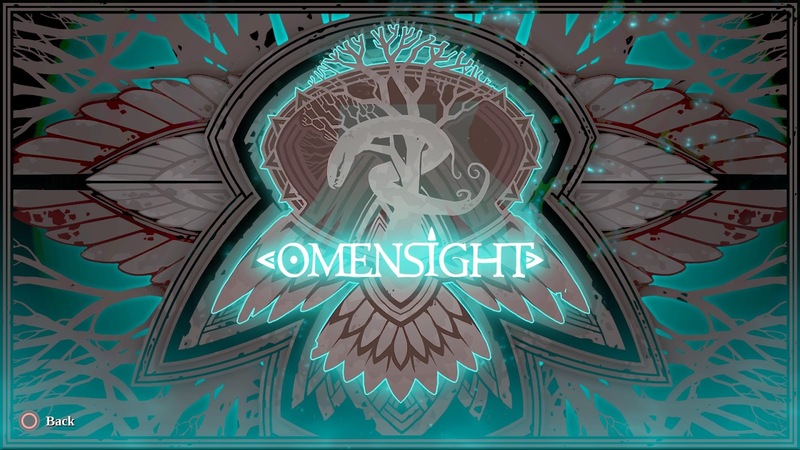 Omensight is available on PC and PS4, I would happily purchase it for PC but I play games via an iMac so unfortunately wouldn't be able too as it's only available on Windows for PC but you can get it via Steam for £15.49. 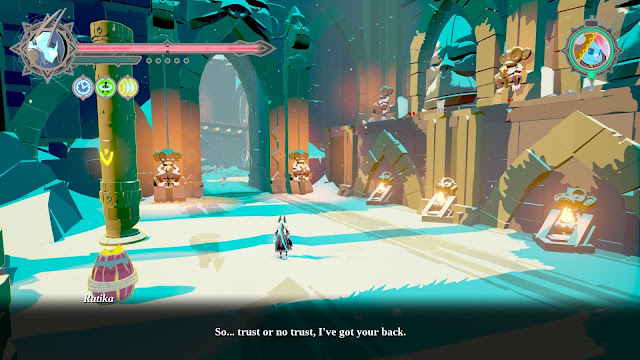 I'm going to give this game 4/5 it wasn't too challenging but as I said you can make it harder, I thought the storyline worked well and was easy to follow, the artwork is beautifully animated and brought to life, and the game could probably make a cool animated movie, if you're not a fan of a game being repetitive I wouldn't recommend this to you (just as a word of warning). Looks great and what a bargain on PC!